Missionaries with Macedonia World Baptist Missions, Inc.
Well here it is two days after Thanksgiving, but I want to say I am thankful. We had a good day and went to have our thanksgiving meal with Sherry's family, the Townsends. We were at her brother Michael's house. Not everyone was able to make it but most were able to at least come by during the afternoon or evening. Sherry is from a family of eleven children and now there are over 50 grandkids, I lose count. Makes for large famiy get togethers. 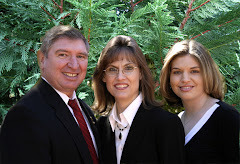 Sherry's parents raised them to love and serve God. I am adding a video of Sherry singing with three sisters and four brothers. Two of her brothers weren't there at the time they sang this and Sherry's twin sister died over twenty years ago. It was late in the evening when they sang this and the lighting in the room is really bad. Still, if you know anything about this family and their lives and service to the Lord, this song will really touch your heart. I have heard them sing it many times and it is a blessing! Today is our 32 anniversary and I want to say how much I love my dear wife Sherry. 32 years ago we started out on our journey together with a desire to serve the Lord. I told Sherry of my hearts desire to carry the gospel message and she said she was willing to follow me anywhere in the service of the Lord. She has certainly done that. After being married only one year and three months we sold out, packed up, and headed to Mexico in February of 1978. Our first house had no electricity and no running water. It cost 18 dollars a month for the rent. Sherry washed all our clothes on a scrub board and that happened most of our first four years in Mexico. Sherry has never complained about the conditions or the hardships we faced along the way. Three daughters and 32 years later, I am happy to say that she continues to help me and encourage me as we serve the Lord together. Thank you Lord for my wonderful wife and thank you Sherry for your unconditional love. I am truly blessed! We had a wonderful Pastors Conference in Atlacomulco, Mexico October the 20th through the 23rd. There was a very sweet spirit throughout the meeting and many pastors, missionaries and their families got a lot of help and encouragement. 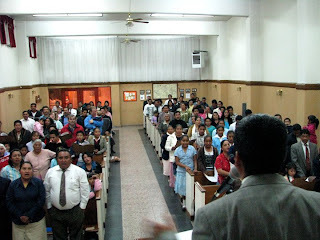 The church members there in Atlacomulco were a great blessing in serving and loving the men of God and their families. There were a number of different preachers that preached and it was all a great blessing. 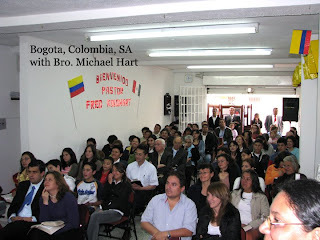 I had the opportunity to preach twice a day and God certianly blessed through it all. Thank you all for your prayers for us on this trip. I am with Jon and Rebecca Allinson in Mexico City right now and will be with them in their services today, Saturday and tomorrow on Sunday. I fly back to Atlanta on Monday. I am having a wonderful time here with the Michael Hart family. 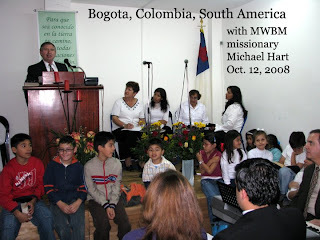 They are missionaries with MWBM and doing a great job here in Bogota, Colombia, South America. Here are a couple of pictures of the service on Sunday morning. As you can see it is a full house and we had a great time. The people listen so well and it has been a blessing to preach to them. I believe we had one saved so far and many lives have been touched. Thank you Bro. Michael and Sister Martha for having me down here and for taking such good care of me. Arrived in Colombia, South America! Hello and I arrived safely here in Bogota, Colombia tonight. I had a good trip and a good visit with the Michael Hart family tonight. Pray for us as I will be preaching several times here over the next few days. I certianly desire to be a blessing. I will try to update you more and maybe have some pictures in a day or two. I had a real good trip to Guatemala the 23 through the 28th. We visited with the David Moore family, missionaries with MWBM. A big thank you to the Moore family for their hospitality. Here is a slide show of pictures I took while we were there. Thank you all for your prayers for world missions. Roger Townsend is doing fine. Glad to say that Roger Townsend is doing fine after their car accident. It did total their vehicle but sure glad they are alright now. Sorry I didn't get this updated posted sooner. This afternoon my brother-in-law, Roger Townsend was in a bad car wreck. It took them some time to get him out of the vehicle and then transport him to the Greenville hospital. After several tests and cat scans they feel he has several broken ribs but that is all. They sent him home and as you can imagine, he will be in a lot of pain for several days. It certainly could have been much worse. They were traveling north on Hwy 8 from Easley to Pickens when a lady either drunk or on dope came over the hill in the far left hand lane of a four lane highway. She hit a pickup head on then a second car, before then hitting Roger and his wife. Janice, Roger's wife was driving and managed to swerve enough to keep from hitting head on but that left Roger pinned in the car until the rescue unit was able to get the doors open. We thank the Lord He was watching over them and they weren't hurt any worse. Thank you all for your prayers. Tomorrow we make the trip back to the USA. We will catch a bus in Toluca that will take us to the airport in Mexico City (30 million people that need Jesus.) From there it is just under a four hour trip to Atlanta and our good brother Dean Hamby will pick us up at the airport. The Lord willing I will be back in the office tomorrow (I think :-) I might just sleep in and play with the grandson before going in! Anyway you should be able to reach me if anyone needs us for anything. Pray for the service tonight here in Atlacomulco. It will be our last service and we are looking for the Lord to bless and touch hearts. We were with MWBM missionaries Kevin and Rebecca Sheridan in their service this morning. We had a good service and then some hot chocolate and sweet bread after the service. Sherry and Joanna sang and I preached. The Lord is blessing the Sheridans and the work there. Keep then in your prayers. 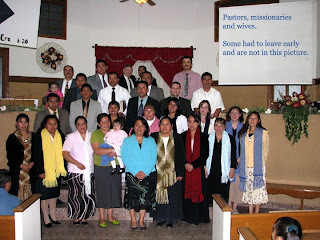 This is a picture of the Church in Atlacomulco, Mexico where we worked for seventeen years. This church is doing well and the Lord is blessing the other churches that have been started as well. We were able to be in the church in Acambay tonight and the Lord blessed again. The folks were very happy to see us and it was so good to see them again and to see their faithfulness to the Lord and His work. Receive Our Latest News As An Email!